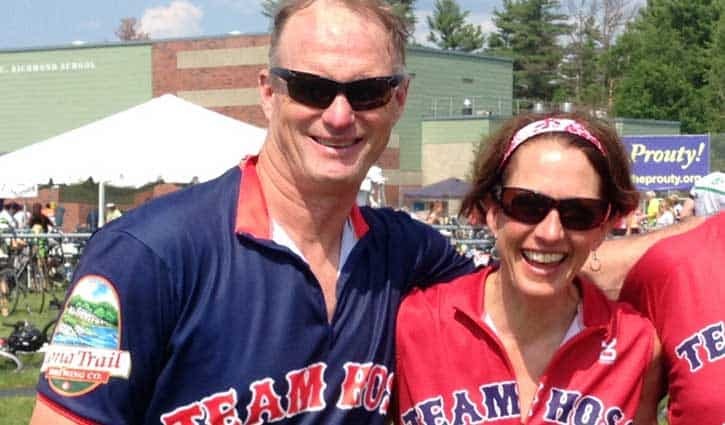 On Saturday, July 12, nearly 6,000 registered cyclists, walkers, rowers, and golfers (and 1,300 volunteers) gathered in Hanover, N.H., for the 33rd Annual Prouty, northern New England’s largest charity fundraiser. Sunshine and comfortable summer temperatures contributed to the festive mood as participants walked or cycled through neighborhoods and roads in New Hampshire and Vermont, rowed on the Connecticut River, or took to the links at the Hanover Country Club. After finishing their events, participants returned to Hanover’s Richmond Middle School to join the all-day Prouty party. They passed through a huge balloon-covered arch at the finish line to enter a field where thousands of people swarmed the food tent, waited patiently for massages, and checked out cancer research breakthroughs at the Discovery Tent. Hungry participants and volunteers lined tables filled with 4,000 burrito bowls and wraps, 1,700 hot dogs, 1,400 burgers, 400 pizzas, 3,000 cookies, freshly cut fruit, and other assorted healthy—and not-so-healthy—foods. Other tents offered live music, shaded seating, team gathering places, and kids’ activities. The Prouty offers physical activities for everyone: from elite athletes to recent cancer survivors. This year, spandex-clad cyclists who tested their endurance on a two-day 200-mile route from Manchester, N.H., mingled with the lively octogenarian members of a “Walkers on Walkers” team from Kendal at Hanover. Many stopped to tie yellow ribbons to the ropes at the finish line, each bearing names and messages for loved ones, a gesture that honors all who have been touched by cancer. Displays in the Discovery Tent highlighted the scientific research at Dartmouth-Hitchcock Norris Cotton Cancer Center (NCCC) that has been supported by Prouty funds. Posters described recent discoveries and cancer prevention findings, and researchers were on hand to show that Prouty dollars make a difference, explaining how their work is being translated into clinical practice. The Prouty also funds patient services such as massage, writing-for-healing workshops, support groups, and patient libraries. These otherwise unfunded services make a huge difference in the lives of cancer patients and their families. Participants in the 33rd Annual Prouty raised more than $2.6 million for cancer research and patient services at Dartmouth-Hitchcock Norris Cotton Cancer Center. “Everyone knows someone who has been affected by cancer and it can make you feel helpless,” said Jean Brown, event director and executive director of the Friends of Norris Cotton Cancer Center. “The Prouty is a way to challenge yourself physically and feel good about actually doing something about cancer,” she added. For more information visit theprouty.org. Unintentional, but well placed, background hair!